Pastel prom dresses and spring formal dresses are romantic and timeless classics. Whether you prefer a pale pink, turquoise, or soft lilac dress, you are sure to captivate in one of these elegant pastel-color dresses. This collection has a variety of long and short pastel-colored dresses that are just right for any special occasion. With pastel prom dresses, spring formal dresses, pastel party dresses for wedding guests, and pastel homecoming dresses to choose from, you are sure to find a dress in a beautifully feminine shade that complements you and your event. These pastel dresses feature the latest trends from alluring v-necklines, flattering a-line shapes, and open-back designs. Channel that refreshing springtime feeling when you wear a pastel dress from PromGirl. Where Can I Find Trendy Dresses in Pastel Colors? Shop PromGirl's collection of trendy pastel dresses for prom and parties to find a variety of the latest styles in soft pale shades. If you are shopping for something short and frilly or long and elegant, there are mini pastel dresses for juniors and floor-length spring formal dresses that have just the right amount of panache, sparkle, and elegance. Try a twirl-ready babydoll pastel dress with an open back or a illusion-sweetheart pastel homecoming dress for a youthful, girly vibe. Looking for a sophisticated style in springtime hues? Check out the pastel prom dresses with plunging v-necklines and pleated pastel party dresses for an elegant, figure-flattering look. Whatever your style and fashion preference is, there are a variety of pastel dresses here. This collection of pastel party dresses and spring formal dresses are from the industry’s top designers. 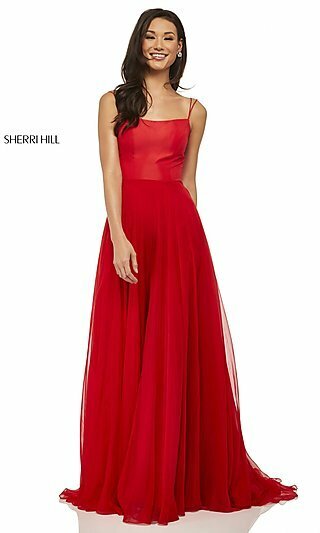 Confidentially shop pastel prom dresses and pastel homecoming dresses from Sherri Hill, Jovani, Blush, Faviana, and more. From couture pastel dresses to beautiful and affordable pastel dresses under $100, find a pastel-colored dress within your budget. Explore this collection for a captivating pastel prom dress that is timeless, elegant, and affordable.